The green (unroasted) coffee beans carry a nutritious profile: 11% proteins, 8% sugars, 16% lipids, 4% minerals, and about 1% caffeine. Green coffee beans are roasted and brewed into coffee as we know it. Global coffee consumption is increasing at a rate of about 2 percent annually. What is coffee? 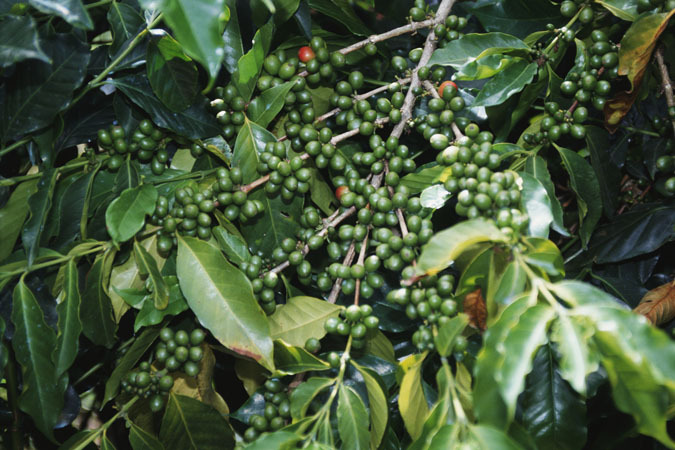 The tropical evergreen shrub known as Coffea produces red fruit with seeds, which we know as coffee beans. These red coffee “cherries” contain two seeds, and are plucked by hand when ripe. During processing, the seeds are removed from a pulpy outer covering, dried and roasted. Coffee plants thrive at higher elevations, from 1000 to 7000 feet depending on growing conditions and distance from the equator. What are the different types of coffee beans? Thousands of species of coffee plants exist, but only two are the main sources of commercial coffee beans: C. arabica and C. robusta (also known as C. canephora). Arabica beans are considered more complex and smoother, while robusta beans are stronger in flavor. Robusta plants are hardier, more disease resistant, and grow at lower altitudes. Commercial beans are often named for their country of origin, roasting level, blend, and other flavor descriptors. Where does coffee come from? The world’s “Coffee Belt” runs between the Tropics of Cancer and Capricorn. Latin America grows 75 percent of the world’s coffee, Africa also produces coffee, and Southeast Asia has become an important coffee region. The top five coffee producers are, from most to least: Brazil, Vietnam, Colombia, Indonesia, and India. Colombia grows only arabica beans. Vietnam grows robusta beans almost entirely. What else does coffee contain? Like all plants, coffee contains thousands of chemical compounds. Roasting and other processing can alter these compounds, making some more volatile and destroying others. Coffee is rich in antioxidants, which may provide health benefits separate from those of caffeine. Coffee’s nutrition profile: 11% proteins, 8% sugars, 16% lipids, 4% minerals, and about 1% caffeine.